Improving health care delivery and individual and population health and controlling health care costs requires, among other things, an effective and efficient health care system. A significant and essential component of the health care system is the clinical professional workforce. Assuring appropriate and up-to-date education and training of this workforce is partly a role of the clinical professional credentialing process. Nursing is the largest clinical profession and one for which credentialing has challenges. Credentialing in nursing has both individual components and institutional components, with the adoption of such programs as the Magnet Recognition Program®, which assesses and credentials the nursing environment in hospitals as a whole. Advancing the field of credentialing of nurses and the organizations in which they work will require evidence generated through interdisciplinary and interprofessional research. This research agenda will reach across many clinical professions including, but not limited to, nursing (in the era of team care); management science; social sciences (e.g., psychology, sociology, anthropology, and economics); information science; epidemiology; biostatistics; health behavior; and health education. This paper describes a framework that can guide the future of research in nurse credentialing and outline research needs that can enhance credentialing’s impact on the improvement of health care delivery. Nurse credentialing encompasses a wide range of activities at both an individual and institutional level. A 2009 fact sheet from the International Council of Nurses (ICN) describes credentialing as “a term applied to processes used to designate that an individual, programme, institution, or product has met established standards set by an agent (governmental or nongovernmental) recognized as qualified to carry out this task. The standards may be minimal and mandatory or above the minimum and voluntary” (ICN, 2009). A 1979 American Nurses Association (ANA) study identified seven forms of credentialing, including licensure, registration, certification, accreditation, charter, recognition, and approval (e.g., ANA, 1979). At the individual level, there are three categories of credentialing: (1) the initial licensure for entry into practice; (2) certifications of specialized skills or training within the scope of the basic professional license, such as certification of critical care nursing or oncology nursing; and, (3) licensure for advanced practice nursing, such as that for nurse anesthetists, certified nurse midwives, or primary or specialty care. For the first and third categories, obtaining a license (or similar authorization from a state government agency) is necessary for practice. Research examining these practitioners and the role of credentialing has examined such questions as whether the presence of larger numbers or proportions of registered nurses (RNs), relative to staff with lower levels of licensure (e.g., licensed practical nurses) or unlicensed staff (e.g., nursing assistants), has an impact on patient care and patient outcomes. Researchers have also sought to determine how patient outcomes and satisfaction for those treated by advanced practice nurses compare to those treated by physicians. In the second category, which concerns certification of expertise within the scope of the professional license, nurses with and without certification may be performing similar patient care activities. Indeed, for some certifications, experience in the specialty, not just formal training, may be a requirement for obtaining certification (ANCC, 2013). Research examining certification may address such questions as whether patient experience and outcomes are better when patients are treated by certified nurses as compared to nurses without certification, or within organizations that employ a workforce with a greater proportion of certified nurses, relative to organizations that do not. The field of individual certification is broad, with many specializations and multiple bodies serving as credentialing organizations. The American Board of Nursing Specialties has 34 nursing certification member organizations. Twenty-eight of those organizations responded to a 2014 survey, and in that survey 26 organizations reported offering 88 credentials for basic RN practice, 14 offered 48 credentials for advanced practice certification, and 3 offered 8 credentials for non-RN practice (ABNS, 2014). The ANCC, as the largest credentialing organization, offers 28 individual certification programs and 12 advanced practice nursing certification programs (ANCC, 2014). Many other organizations also offer certification, and the concept of certification has been extended from the registered or licensed workforce to nonlicensed staff such as nurses’ aides or patient assistants. The concept of credentialing the operation and performance of nursing at an institutional level has its origins in research on hospitals that were able to attract and retain professional nurses: “magnets” for nurses. The original research on these magnet hospitals identified fourteen characteristics that differentiated them from other hospitals (Kramer and Schmalenberg, 1991a,b; McClure et al., 1983; McClure and Hinshaw, 2002). In 1990, the American Nurses Association, through its ANCC, created the Magnet Recognition Program® to formalize the process of designating hospitals as magnets. As part of this process, ANCC organized the 14 characteristics associated with magnetism into five broad categories: transformational leadership; structural empowerment; exemplary professional practice; new knowledge, innovations, and improvements; and, empirical outcomes (ANCC, 2012). ANCC later created a second institutional credentialing program, the Pathway to Excellence® program, which also accredits organizations that provide continuing nursing education. Constituency groups have different perspectives as to the importance of each of these purposes of credentialing (Table 1). Research on credentialing needs to consider and be responsive to the needs of each constituency group or stakeholder, in terms of both the questions to address and appropriate presentation of results. 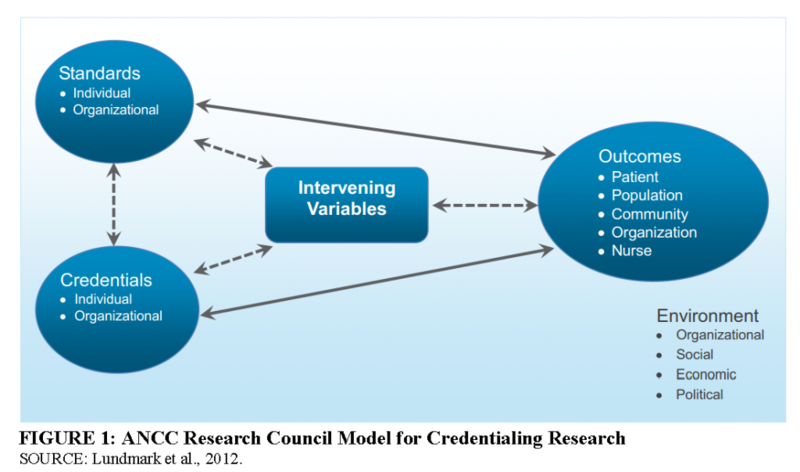 The ANCC Research Council developed a model for credentialing research (“ANCC model”) (see Figure 1), which was presented in 2012 (Lundmark et al., 2012). The ANCC model focuses on the outcomes that may be associated with the presence of standards and the acquisition of credentials by individuals and organizations. The pathways by which credentials may affect outcomes are referenced in the box labeled “Intervening Variables,” but these are not presented in detail. Similarly, environmental factors (e.g., competitive market pressures, the encouragement of regulators or accreditation organizations, organizational requirements, individual aptitude for individual certification, and cost), which might influence decisions by individuals or organizations to obtain credentials, are alluded to in the section labeled “Environment” but are not closely connected either to the decision to seek credentials or to credentialing outcomes. The ANCC model is best suited for summary or “reduced form” analysis of the association between credentialing and outcomes. These analyses might include examinations of the correlation between outcomes and credentials, or multivariate regression analysis of the association between outcomes and the presence or absence of credentials at the organizational or individual level. Indeed, most of the research on credentialing conducted to date has been of this form. The ANCC Research Council summarized the research on credentialing in its 2012 report (Lundmark et al., 2012). It found a stronger research base for assessing organizational credentialing than for individual credentialing. With respect to individual credentialing, it found several studies on the nurse-reported value of certification, and some relating certification to professional knowledge or behavior. However, only a few studies focused on the link between individual certification and patient outcomes. With respect to organizational credentialing, the ANCC Research Council found a substantial literature assessing the association of magnet status with patient outcomes and nurse work environments. With respect to patient outcomes, studies have found associations between Magnet status and mortality, failure to rescue, falls, nosocomial infections, and other outcomes. Since the ANCC report, additional studies demonstrating an association between Magnet status and outcomes have been published, such as that by McHugh and colleagues (McHugh et al., 2013). Other studies, using different comparison group strategies, have not found an association between Magnet status and patient outcomes (Hickey et al., 2010; Goode et al., 2011). A second stream of research has examined the association of Magnet status with characteristics related to the concept of magnet status, notably work environment (Lundmark, 2008). As noted in the 2012 ANCC Research Council report (Lundmark et al., 2012), these studies have found a wide range of nurse-related outcomes (such as lower turnover, reduced burnout, and willingness to recommend nursing as a career) associated with better nursing environments, including characteristics such as staffing, nurse-perceived quality, adoption of National Quality Forum (NQF) safe practice standards, and higher scores on the nursing work environment index. The latter most of these has been shown to be associated with improved patient outcomes. In general, these research findings cannot be interpreted to indicate that credentialing causes patient outcomes. Indeed, when causal interpretations have been made for this research, they have been challenged. Several problems exist in assessing causality. First is selection: the possibility that organizations or individuals who already have better outcomes, or are most likely to improve with additional training and education, may be most likely to obtain credentials. If all organizations and individuals that had superior performance were credentialed, selection would not necessarily be a problem, since the credential would provide a clear signal of better performance, even if the association between credentialing and patient outcomes was not causal. However, because cost and market factors may discourage—or at least not encourage—organizations and individuals to seek credentials, the value of the credential to individual health care professionals and to health care organizations is unclear. Likewise, there is the possibility that factors associated with credentials, but not directly a cause or effect of credentials, explain the better outcomes. Research that does not fully take these factors into account will suffer from omitted variable bias, and may be challenged as not demonstrating causality. There are a variety of ways of addressing concerns about causality. Randomization is the gold standard for demonstrating causality, but the prospect of randomizing individuals or organizations into or out of credentialing efforts is unrealistic. Some research has used selection correction methods like propensity scoring and instrumental variables, but these efforts have had mixed success and have not fully dispelled doubts of the link between credentialing and outcomes. Another approach is to study the pathways by which credentialing are associated with outcomes and to explore the causal links explicitly. The above reference to the association of Magnet status with improved work environment, and of better work environment with patient outcomes, is an illustration of such studies. By establishing a clear causal pathway from credentialing to outcomes, the problems of selection bias, omitted variables, and lack of randomization for interpreting associations causally are reduced. To effectively establish causation, potential pathways between credentials and outcomes need to be explicated, so they can be explored in research. 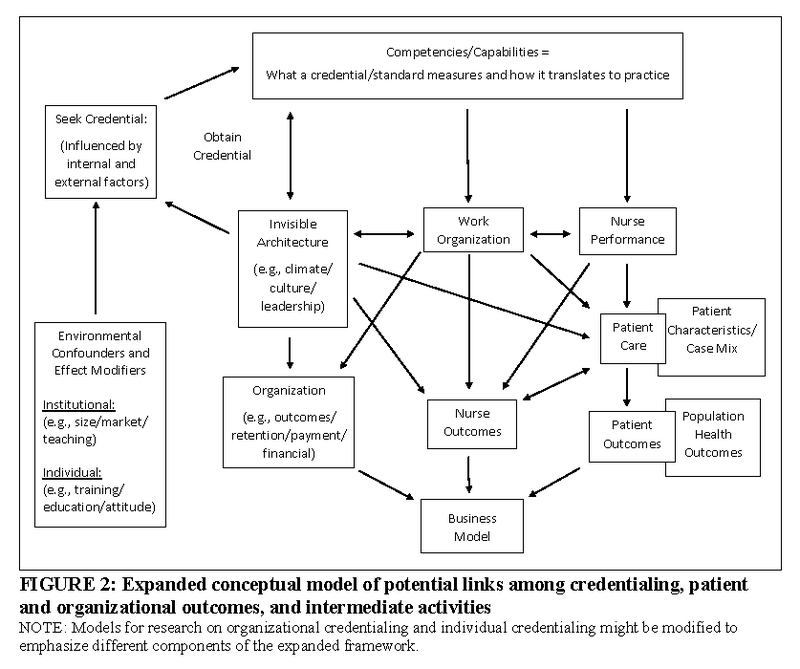 Figure 2 presents a new model for both organizational and individual credentialing, an expanded framework that presents the antecedents to the decision to seek a credential and the pathways by which credentialing might be associated with outcomes. (The authors recognize that some modifications to the expanded framework in Figure 2 would be appropriate to better reflect the impact of organizational and individual credentials.) Building upon the work represented in the ANCC model, Figure 2 includes a more fully developed framework with potential causal pathways explicitly identified to better characterize “Intervening Variables” and the role of the environment. To implement this framework in research on credentialing, researchers will need to expand the range of concepts incorporated into each cell in the conceptual framework, identify measures for each of the concepts, and develop strategies for obtaining data that allow the measures to be constructed. The first key modification to the ANCC model in Figure 1 is to recognize that the decision by an organization or individual to seek a credential is a choice, influenced by the local market for hospital or nursing home services or the labor market for nurses. Market factors affecting the decision to seek credentialing include: whether there is competition in which the credential can be an asset; whether additional pay or a better job is associated with an individual credential; and, whether there is a climate (such as academic environment) that supports decisions to obtain formal credentials. The internal environment’s impact on credentialing decisions is reflected in the response from the organization’s invisible architecture (i.e., culture, leadership, and climate) to the decision to seek a credential. As noted earlier, selection is a major confounder in comparing the experience of credentialed versus non-credentialed individuals and organizations. Identifying factors that influence the decision to obtain credentials can help control for these factors or identify natural experiments, which allow these factors to be controlled. It is important to understand the extent to which credentialing measures existing competencies and capabilities (both specific and general) and how they are changed by the credentialing process. The top of expanded framework in Figure 2 includes the competencies and capabilities associated with the credential. These need to be explicated for each type of credential that is being studied. Some competencies will be specific or technical. At the individual level, these might include specific skills or knowledge. At the organizational level, these might include specific organizational structures or functions, such as nursing research. Some competencies will be less specific, for example, increased assertiveness by individual nurses. Some competencies, such as improved communication, might blend both the specific and general. One area of research should be the extent to which seeking a credential is associated with changes in these competencies and capabilities, both specific and general. Phrased somewhat differently, we need to understand the extent to which credentialing measures existing capabilities or the process of seeking credentials changes them. The bottom of the expanded framework in Figure 2 separates outcomes into four categories: patient outcomes, population health outcomes, nurse outcomes, and organizational outcomes. Patient outcomes extend to the domain of population health outcomes, in recognition of the emphasis on population health outcomes in the Institute for Healthcare Improvement and Centers for Medicare and Medicaid Services-adopted triple aim for health care (Berwick et al., 2008). The expanded framework of Figure 2 simplifies the pathway by which patient outcomes are influenced by patient care, but these outcomes should be risk adjusted for patient characteristics. Patient outcomes can be negative (e.g., death or development of adverse complications) or positive (e.g., shorter lengths of stay, and effective preparation for self-care or post-acute care). They can also be specific or general, such as positive feelings about a health care provider and willingness to return to the provider or recommend the provider. Nurse outcomes should be viewed expansively, and include factors that influence the health and satisfaction of nurses professionally, and factors that affect nurses’ abilities to perform their work. Some nurse outcomes (such as burnout, job satisfaction, nurse safety and occupational health) are important in and of themselves. Others, such as turnover or commitment to participating in performance improvement activities, have consequences for patient care and organizational outcomes. Organizational outcomes include financial outcomes (including pay for performance impacts), the ability to meet organizational or community goals, and the ability to retain staff and reduce turnover costs. Organizational outcomes are influenced by both patient and nursing outcomes, and vice versa, but to make Figure 2 more readable, we have not drawn these two-headed arrows between the boxes on the bottom row. For organizations, decisions about the value of credentials, either organizational or among individual staff, will be influenced by business case considerations. This influence is represented in the expanded framework in Figure 2 by the “Business Model” box. A business case analysis focuses narrowly on the costs of an initiative or activity for the organization and the impact of the initiative on revenues, asking whether the revenues will exceed the cost, or the initiative will have the effect of reducing costs. Business case analyses of quality initiatives, including improving nurse staffing, have found repeated instances where there was a clear social case coupled with a negative organizational case (Leatherman et al., 2003; Needleman, 2008; Needleman et al., 2006). Organizations considering seeking Magnet status or deciding whether to encourage staff to obtain individual credentials will raise questions about the costs and cost offsets, as well as net quality impacts. The expanded framework in Figure 2 identifies three pathways that link credentialing and outcomes: (1) through individual nurse competence and performance, (2) through work organization, and (3) through the invisible organizational structures of culture, leadership, and climate. These pathways may have strong interactions among each other. For example, consider the impact of having nurses with specialized training in wound care. This will have a direct effect on the ability of these nurses to deliver better care. It may also influence the organization of care on a unit, as charge nurses assign patients with, or at greater risk for, pressure ulcers to credentialed nurses. The presence of nurses trained in skin care may also lead to more assertive unit managers who demand changes in procedures to reduce patient risk or encourage informal or formal consultation with trained nurses, or increasing in-service training by certified nurses. All these approaches may affect the culture of teamwork and evidence-based practice within units, directly and indirectly affecting both wound care and other aspects of patient care. Analogously, efforts to introduce capabilities for nurse-led process improvement or nursing research on patient care as part of seeking Magnet designation may improve culture, work environment, team organization, and individual nurse’s skills. The interactions between individual performance, work and team environment, and culture and leadership capture organizational realities and underscore the complexity involved in analyzing the pathways of influence for credentialing. Research to understand the impact of credentialing thus needs to examine not only direct effects on individual nurse performance, but also the impact on work organization and environment, and culture and leadership, as well as the direct and indirect impacts of these on patient and other outcomes. It is almost certainly the case that each of these pathways has some role in outcomes, but the relative strength and salience of each path needs to be assessed. There has been extensive work to identify critical knowledge gaps in credentialing research (Hickey et al., 2014; Lundmark et al., 2012). In addition to examining the causal pathways by which credentialing influences outcomes, two additional priority areas for future research exist: (1) assessing the value of nurse credentialing (e.g., what are the benefits to patients and health care providers), and (2) developing methods for credentialing research. Research about the value of nurse credentialing seeks to answer questions about why individual nurses and organizations should pursue, support, or require credentials. This research must identify the need (as perceived by various stakeholders) for a credential, and assess the degree to which that need is effectively being addressed. Understanding the nature and magnitude of the “need” that the credential is seeking to address is particularly important when considering the potential impact of the credential on system change and patient outcomes. Examples of broad questions include: What benefit does individual or organizational credentialing bring to nurses and patients? Are higher proportions of certified nurses associated with better patient outcomes? Developing rigorous methods to reduce bias is a second priority area—both at the individual and the organizational level. The current body of evidence is predominantly observational in nature, with a large number of organizational studies (e.g., Magnet versus non-Magnet comparisons, some with well-developed strategies to control for bias and selection). However, studies related to the impact of individual nurse credentialing are not conclusive and are often are fraught with inherent biases (e.g., small samples, relational studies with no comparison groups, and convenience samples). Examples of methods questions include: What outcome measures are sensitive to nurse credentialing? What are the critical endogenous or confounding factors to consider when assessing the effects of individual and organizations credentialing? We believe that value and methods represent the two most important research priorities for nurse credentialing. Both are aligned with improving health care and national quality goals (HHS, 2011), yet there are major challenges ahead to accelerate the conduct of credentialing research. The challenges to conducting nurse credentialing research include: (1) Few external stakeholders to nursing that are calling for research on the value of credentialing; (2) Nurse credentialing has not been a high priority for extramural funding; (3) Methods used in nurse credentialing research studies require additional development; (4) Limited data is available to study nurse credentialing, particularly for research that examines the pathways by which credentialing may influence outcomes of interest; and (5) Dissemination of nurse credentialing research is difficult at best, since nursing is practiced across diverse settings, populations, and geographic locations (e.g., rural, urban, hospital, and community). The low external stakeholder demand for research on nurse credentialing has several implications, including potential effects on patient outcomes. If nurse credentialing were demonstrated to be closely associated with quality and safety, stronger demands for alignment of nurse credentialing with quality and safety initiatives may result. These demands might include incorporating nurse credentialing into quality metrics, such as National Committee for Quality Assurance or NQF measures. This would stimulate the adoption of credentials, and expand the quantity and quality of data available to further assess the impact of credentialing. Currently, data collection about staff qualifications has increasingly focused more on interprofessional teams and the measurement of collaboration (e.g., Ajorlou et al., 2014; Lemieux-Charles and McGuire, 2006; Sinsky et al., 2013) and less on individual contributions to health care outcomes. Nonetheless, research on the contributions of individuals is advancing (Yakusheva et al., 2014), and could become a broader area of inquiry. As the nation seeks strategies to improve the value and effectiveness of care, nurse credentialing research will need to demonstrate substantial impacts of credentialing in early studies if credentialing research is to become a priority. science with high impact. Credentialing research must gain enough momentum to pique the interests of funders, who will then formulate new credentialing questions. A third challenge involves developing better methods to be employed in credentialing research, given that some evidence summaries have noted several major problems with these methods (e.g., Lundmark, 2008; Lundmark et al., 2012). One problem noted is the high prevalence of observational studies (survey and secondary data) that are relational in nature rather than comparative. A second problem is a lack of conceptual and operational clarity in the definition and interpretation of variables used in the existing research. Variability in the psychometric reliability of the testing of nurse credentials and variation in the units of analysis, which can range from individuals to units to whole organization, also exist. And as previously discussed, the issue of causality complicates attribution of outcomes to organizational or individual credentials. Recent Institute of Medicine studies on the learning healthcare system (IOM, 2012, 2014) and the challenges of reducing bias in observational studies and data harmonization in research to support learning healthcare systems (IOM, 2013a,b,c) have struggled with some of these methodological issues, and have high utility for nurse credentialing. A standard set of metrics for measuring nurse credentialing would be a good first step. The fourth challenge in conducting credentialing research concerns the limited data available on the credentials of individual nurses, the extent to which credentialed nurses work in different health care settings and institutions, and the ability to link individual patients to more or less credentialed individual clinicians. Similarly, the promotion of minimal standards that establish psychometric properties for the evaluation of individual candidates for certification is a prerequisite for expanding the reach of credentialing research. Without extensive and reliable data, research on the impact of credentialing, and processes by which it influences care, will remain limited. The fifth challenge involves the dissemination of credentialing research, a task made difficult by the vast differences among settings and populations, as well as the variation in the credential skills, knowledge, and abilities being measured. Credentialing research has predominantly focused on hospitals, and the effect of credentialing may not generalize to all settings. To the extent that future research focuses on the linkages between quality of care and nurse and patient outcomes, dissemination will be facilitated. High-quality health care requires a workforce of providers who possess the education necessary to meet the needs of the people they serve. Individual and organizational credentialing in nursing may ensure that established standards deemed important for the delivery of high-quality care are met. The effect of the credential on nurse, patient, and organizational processes and outcomes is the central focus of credentialing research in nursing. This perspective proposes a credentialing research framework to guide future studies and identifies three priorities for future research on credentialing: assessment of the causal link between credentialing and patient, nurse, and institutional outcomes; evaluation of the value of nurse credentialing (e.g., benefits to patients and health care providers); and, development and dissemination of rigorous methods to be employed in credentialing research. ABNS (American Board of Nursing Specialties). 2014. Nursing Specialty Certification. http://nursingcertification.org/pdf/2014%20credentials%20and%20certificants%20information.pdf (accessed August 18, 2014). Ajorlou, S., I. Shams, and K. Yang. 2014. An analytics approach to designing patient centered medical homes. Health Care Management Science [Epub ahead of print], http://dx.doi.org/10.1007/s10729-014-9287-x (accessed August 5, 2014). ANA (American Nurses Association), Committee for the Study of Credentialing in Nursing, and University of Wisconsin–Milwaukee School of Nursing. 1979. The study of credentialing in nursing: A new approach. Kansas City, MO: American Nurses Association. ANCC (American Nurses Credentialing Center). 2012. History of the Magnet Program. http://www.nursecredentialing.org/magnet/programoverview/historyofthemagnetprogram (accessed July 8, 2014). ANCC. 2013. Certification: General Testing and Renewal Handbook. http://www.nursecredentialing.org/Certification/CertificationRenewal/GeneralTestingandRenewalHandbook.pdf (accessed August 18, 2014). ANCC. 2014. ANCC Certification Center. http://www.nursecredentialing.org/certification.aspx#specialty (accessed July 24, 2014). Berwick, D.M., T.W. Nolan, and J. Whittington. 2008. The triple aim: care, health, and cost. Health Affairs 27(3): 759-769. Goode, C. J., M. A. Blegen, S. H. Park, T. Vaughn, and J. Spetz. 2011. Comparison of patient outcomes in Magnet and non-Magnet hospitals. The Journal of Nursing Administration 41(12):517–523. HHS (US Department of Health and Human Services). 2011. National Strategy for Quality Improvement in Health Care: 2011 Report to Congress. http://www.ahrq.gov/workingforquality/nqs/nqs2011annlrpt.htm (accessed August 6, 2014). Hickey, J. V., L. Y. Unruh, R. P. Newhouse, M. Koithan, M. Johantgen, R. G. Hughes, K. B. Haller, and V. A. Lundmark. 2014. Credentialing: The need for a national research agenda. Nursing Outlook 62(2):119–127. Hickey, P., K. Gauvreau, J. Connor, E. Sporing, and K. Jenkins. 2010. The relationship of nurse staffing, skill mix, and Magnet recognition to institutional volume and mortality for congenital heart surgery. The Journal of Nursing Administration 40(5):226–232. ICN (International Council of Nurses). 2009. Credentialing: Fact Sheet. http://www.icn.ch/images/stories/documents/publications/fact_sheets/1a_FS-Credentialing.pdf (accessed July 8, 2014). IOM (Institute of Medicine). 2012. Best care at lower cost: The path to continuously learning health care in America. Washington, DC: The National Academies Press. IOM. 2013a. Core measurement needs for better care, better health, and lower costs: Counting what counts: workshop summary. Washington, DC: The National Academies Press. IOM. 2013b. Digital data improvement priorities for continuous learning in health and health care: workshop summary. Washington, DC: The National Academies Press. IOM. 2013c. Observational studies in a learning health system: Workshop summary. Washington, DC: The National Academies Press. IOM. 2014. The Learning Health System Series: Continuous improvement and innovation in health and health care. http://iom.edu/~/media/Files/Activity%20Files/Quality/VSRT/Core%20Documents/LearningHealthSystem.pdf (accessed August 9, 2014). Kramer, M., and C. Schmalenberg. 1991a. Job satisfaction and retention: Insights for the ’90s—Part 1. Nursing 21(3):50–55. Kramer, M., and C. Schmalenberg. 1991b. Job satisfaction and retention: Insights for the ’90s—Part 2. Nursing 21(4):51–55. Leatherman, S., D. Berwick, D. Iles, L. S. Lewin, F. Davidoff, T. Nolan, and M. Bisognano. 2003. The business case for quality: Case studies and an analysis. Health Affairs 22(2):17–30. Lemieux-Charles, L., and W. L. McGuire. 2006. What do we know about health care team effectiveness? A review of the literature. Medical Care Research and Review 63(3):263–300. Lundmark, V. 2008. Magnet Environments for Professional Nursing Practice. In Patient Safety and Quality: An Evidence-Based Handbook for Nurses, edited by R. G. Hughes. Rockville, MD: Agency for Healthcare Research and Quality. Pp. 369–390. Lundmark, V., J. Hickey, K. Haller, R. Hughes, M. Johantgen, M. Koithan, R. P. Newhouse, and L. Unruh. 2012. A National Agenda for Credentialing Research in Nursing. www.nursecredentialing.org/2012-CredentialingResearchReport.aspx (accessed August 6, 2014). McClure, M., M. Poulin, M. Sovie, and M. Wandelt. 1983. Magnet Hospitals: Attraction and Retention of Professional Nurses. Kansas City, MO: American Academy of Nursing. McClure, M. L., and A. S. Hinshaw. 2002. Magnet Hospitals Revisited: Attraction and Retention of Professional Nurses. Washington, DC: American Nurses Publishing. McHugh, M. D., L. A. Kelly, H. L. Smith, E. S. Wu, J. M. Vanak, and L. H. Aiken. 2013. Lower mortality in magnet hospitals. Medical Care 51(5):382–388. Needleman, J. 2008. Is what’s good for the patient good for the hospital? Aligning incentives and the business case for nursing. Policy, Politics & Nursing Practice 9(2):80–87. Needleman, J., P. I. Buerhaus, M. Stewart, K. Zelevinsky, and S. Mattke. 2006. Nurse staffing in hospitals: is there a business case for quality? Health Affairs 25(1):204–211. Sinsky, C. A., R. Willard-Grace, A. M. Schutzbank, T. A. Sinsky, D. Margolius, and T. Bodenheimer. 2013. In search of joy in practice: a report of 23 high-functioning primary care practices. Annals of Family Medicine 11(3):272–278. Yakusheva, O., R. Lindrooth, and M. Weiss. 2014. Nurse Value Added and Patient Outcomes in Acute Care. Paper presented at the Academy Health 2014 Annual Research Meeting, Washington, DC.